EASY RECIPES FOR CHICKEN WINGS low carb and keto friendly! 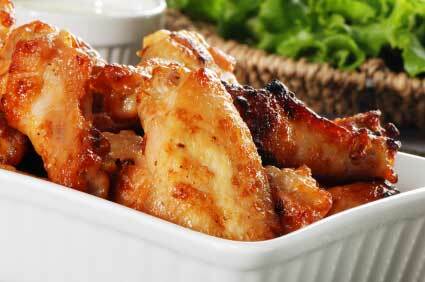 Recipes for chicken wings usually feature sweetened BBQ sauces or breading. That's not on a low carb diet. But you CAN have delicious chicken wings when you prepare them properly. I find chicken wings are a sort of comfort food. And recipes for chicken wings top the charts for the most requested party food. It just smacks of good times and good fun. You can dress them up or keep them really casual. One thing is for sure; wings are best eaten with your fingers. Give your guests lots of paper napkins and watch those wings fly off the table! It used to be that chicken wings would get tossed out or reserved for making chicken stock. To say wings were really cheap way back is an understatement. Nowadays wings are much more expensive. 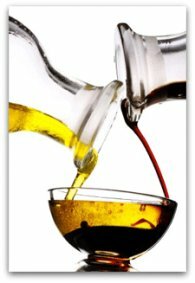 You can save a little by buying them whole and separating them at home. You can keep the wing tips for chicken stock. Although it's not clear who invented the first chicken wing recipe, rumor circulating suggests that Teressa Bellissimo, owner of the Anchor Bar in Buffalo New York, did. Faced with the arrival of her son's college friends very late one night back in 1969, she just decided to deep fry some wings in the deep fryer rather then put them in her stock pot. Then she simply tossed them in hot sauce and chicken wings became a huge hit! Since then, chicken wings have been flavored in many, many ways. Dining out can be problematic. Most restaurants dust their wings in flour before they're deep fried. Always ask. Most restaurant chains use pre-seasoned frozen wings. I've asked for wings without batter or breading and I've been turned down because they didn't have any. Places that specialize in chicken wings will offer them up "naked" with sauces on the side, which makes navigating the menu much easier. I love making wings at home. To make things really easy I’ve made a list of the most in-demand recipes. Just go through the list and select what makes your mouth water! 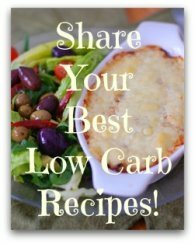 All of the recipes are perfect for a low carb diet and for entertaining. Here are some of the recipes I'm working on right now. 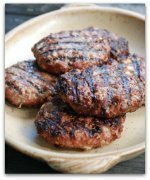 Turning old favorites into low carb version takes a bit of work, so please be patient. I promise it'll be worth the wait.